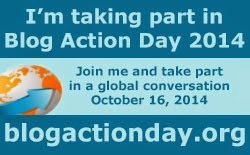 Today I'm taking part in Blog Action Day 2014, a day where bloggers and content creators around the world unite to talk about a common subject - this year we're focusing on inequality. Inequality is everywhere, and it goes from the most powerful/rich people in the world, down to ordinary people like you and me. I'll start by sharing a story which doesn't paint me in a good light. I was on a train recently, and in the next row of seats was two teenage girls, who basically seemed to spend the journey talking about drinking, fit boys, family members of theirs being arrested, getting benefits from the government (one of the girls was on disability living allowance, so I'm led to understand) and various other topics which did include some talk about drugs. I never saw the girls during the journey as they were in the row in front of me, but everything that they were talking about, and their accents, led me to think "there's a couple of chavs". I automatically wrote them off as human beings with any possibility of having any kind of potential in life. Yet, when the guy in the business suit at the other side of the carriage got up to leave the train and left his umbrella behind, immediately one of the girls called over to him and asked him if he'd forgotten it. In my judging of these two girls I had assumed that they would have stolen it, or certainly let him get off the train without taking it. And it made me realise that my judgements had been wrong. Later in the journey they talked about how they wanted to get on and get their driving licenses, and go to college. I'm not pleased by my thoughts about these two girls but it makes me think just how easy it is to judge people without knowing their situation. And this is something that I do believe the vast majority of us do. There is a limit to what that the majority of us can do about the big issues of inequality - for example, the fact that if you combined what the 3.5 billion poorest people in the world owned, it would equate to about the same as the 66 richest people owned. That doesn't mean that we shouldn't try - you can contact your governmental representative (MPs, senators, whatever they're called in your country) to ask what they are doing about inequality, and to highlight any particular issues close to your heart. You can join a campaign group - whatever subject it is that is close to your heart, there is probably a campaign group for it, which may well be able to advise on how to take action and make a difference. We can read about it, and the Blog Action Day website is a great place to start, as it coordinates the hundreds of blogs coming out today about inequality. If you blog yourself, you can promote the topic yourself. But what we can also do is fight inequality where we see it, in our lives. Challenge yourself to be less judgmental. Remember that whatever decision someone takes, whatever thing it is that they say, whatever they look like, or what job they do, they have had a lifetime of experiences and influences that has led them to make that choice, to say that thing, to do that job. And recognise that while you may not agree with what they do or say, or sound like, that it may be valid for them to be the way that they are. With that in mind, I'm going to write briefly about ulcerative colitis. The cause of it isn't clear. The theory is that it is caused by a combination of a number of factors - genetics, an abnormal reaction of the body's immune system, and something in the environment as a catalyst - which could be something you eat, viruses, bacteria, smoking, stress... but these aren't clear, and they aren't universal - one person may be able to eat whatever they like, while others (like me) have to avoid certain types of vegetable. For those that know me personally, don't worry - my condition is currently in remission, it doesn't really have any effect on my day to day life right now. It may flare up in the future, or it may not - I try to look after myself to ensure that it doesn't. But conditions like mine can be difficult to talk about, and isn't helped by being misreported in the press as something that happens to people that eat junk food. If you want to find out more, I recommend the Crohn's and Colitis UK website, and in particular their guide on understanding IBD. The point of the above is not for me to get sympathy (right now I'm absolutely fine - no sympathy required!) but to raise awareness of the condition. Many people - indeed, I'd suggest most people - suffer with one or more mild or severe health conditions of some sort, whether it's a severe disability or just a knee that won't bend as well as it used to. Understanding that may help you to give people a little bit more leeway if they don't move quite as fast as you expect them to, or take a moment longer to react to something. Hey, that is a very good point, there is nothing more important than understanding. I hope they find a cure, but first, I guess, they need to find a cause. Cheers Tim :) Don't get me wrong, right now it barely affects my life at all, but I guess I'm making the point that not all medical conditions are obvious to people when you first encounter them.